Keeping up to date on what all the big name celebrities are up to is a billion dollar business. Everywhere you look you see up to date information on the celebrities comings and goings. The main avenue for the latest information is through television. The television network MTV keeps people up to date on the latest music and movie news. A feature they have at their studios is a photobooth where all the stars take photos before going on the shows. These photos are displayed in their studio and are shown on the television. For their New Yearâ€™s party the photos are shown as a year in review of all the guests of their network. Celebrities even rent out photobooths for their birthday parties and weddings. Some people such as Hugh Hefner have photobooths in their homes permanently for all their house guest to use. 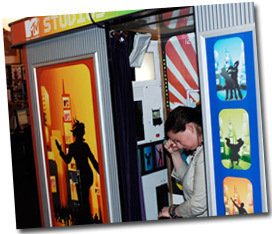 Award shows such as the Golden Globes have also had photo booths at their events as fun attractions for guest to frequent. You can also follow Hollywoodâ€™s trend and have a photobooth at your event. Whatever the event a photo booth can guarantee your guests will have a great time and will be talking about your event for years to come. Everybody who attends your event will have loads of fun taking silly photos for them to keep. Guests enjoy frequenting the photo booth over and over again trying to come up with the best poses. Providing props also gives them increased ways of taking the best or funniest photos. The cost of renting a Michigan photobooth will vary depending of which company you use and how long you rent the booth for. The average photo booth rental will range between $650-$1500. Normally you get more of a deal if you rent the photo booth for more hours in comparison to a shorter length of time. The cost of rental should include an attendant as well as installation and delivery. The attendant is important to have because they maintain the booth and insure the booth will work properly the entire length of your rental. They also interact with your guests and explain the process to each guest. The majority of photo booth companies also offer additional features. A customized footer that you design is included on each photo strip your guest receive. Scrap booking is also a feature that the majority of companies offer. When you leave your event the attendant will have a scrap book with all the photos that your guests took throughout the night. The copy of the photos that your guests keep is an instant party favor for all of your guests to take home with them and display in their homes. With the advancements in photography the photos you receive are high quality, unlike the photos back in the 50’s. 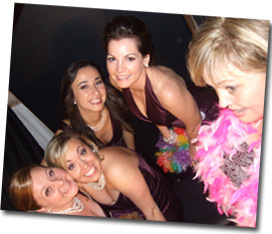 Having a photo booth at your event will make your event memorable and exciting for your guests of all ages. Depending on the photo booth rental company, your photos may also be display on a online site that you and your guest can visit whenever.